This is the moment a motorcyclist fell asleep while driving and ended up falling into a ditch at the side of the road, next to a rice paddy. 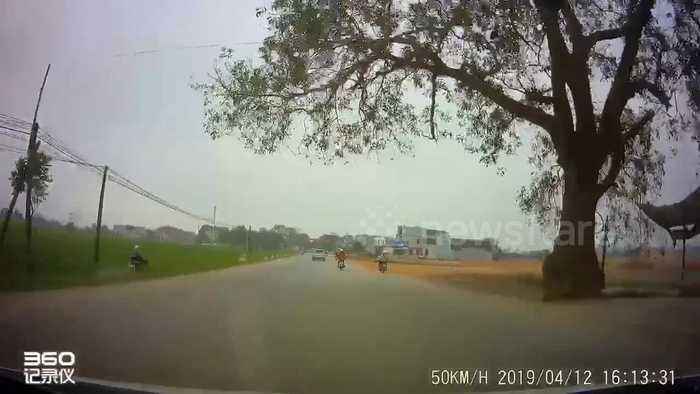 Le Hai Vu, who was driving in the vehicle behind and captured the incident on dash-cam, said: "I saw a man riding a motorbike in front of him and suddenly the man ... crossed the road, plunging to the rice field." Once seeing the man drift off the side of the road and in the irrigation ditch, Vu stopped the car and quickly rescued the motorcyclist. The video was captured on April 12 in Thanh Hoa Province, Vietnam.